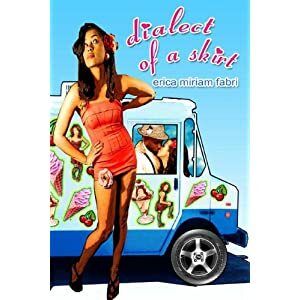 Self proclaimed as a "foxy poet," Erica Miriam Fabri combines hints of magical realism, bizarre whimsy, and unapologetic sexuality in her debut collection, Dialect of a Skirt. Fabri divides the book into five sections, each titled after a different item of a woman's wardrobe. The work is concerned with themes of biracial love, reinventing the love poem, and particularly the tangibility of words. Spoken through the voices of unusual characters, the book introduces the reader to a strange world intrinsically seductive and compelling. and one lip touch his chin: looking for words, she said. because he had heard a bag of wooden letters rattle in the dark. Fabri explores themes of the power of language to rework human perception, creating depth and attachment to the ordinary. Her images are lush, falling effortless atop one another. She forces readers to perceive a world where pills become dragonflies and onions explode in the mouth like firecrackers. In "When the Muse Comes Home," Fabri chronicles how the poet spends her days "rearranging words" (10) and imagining new ways to "say red. "(9) It is this attention to creating new ways of transforming the commonplace that makes her poems sing. too lonely to live without your silver flesh. Once again, Fabri offers up her images as delicacies readers are unable to refuse, pandering her words like a New York street vendor. But something about Fabri is undeniably compelling. Maybe it's her slick use of metaphor, her sassy line breaks, or fiercely feminine perspective. Whatever the case, Fabri's work stands as a stunning first achievement and a fresh voice in poetry. Joy Sullivan is currently pursuing an MA in Poetry at Miami University in Oxford Ohio.